Q: What are my options when it comes to kitchen cabinets? A: Most people who are new to remodeling aren’t privy to the variances between stock cabinets, semi-custom and custom cabinets — but the three can be wildly different in more ways than cost alone. Since cabinets will probably be the largest expense of your remodel regardless, you’ll want to be well informed before you invest. Stock cabinets are manufactured in large quantities and available on-demand at retail stores. Semi-custom and custom cabinets refer to more nimble manufacturing processes, in which you pay more for the option to have customization and upgrades. Custom cabinets are built by a craftsman or small company, often locally, and made-to-order. Semi-custom cabinetry falls somewhere in between: when a cabinet maker has both custom capabilities and less expensive pieces that have been mass-produced. There are benefits and downfalls to each kind, so taking a few moments to learn about how cabinets are made is well worth it. Style is likely the main factor impacting your cabinet order. Frameless styles are increasingly popular, but if you’re trying to match a cabinet style in your older home, you may need to find a custom or semi-custom maker. Remodeling can mean odd measurements and strict layouts that will require at least a few custom cabinet sizes to reach the desired look. A custom cabinet maker will be able to closely match your selection for decades to come, and provide you with touch-up kits that can come in handy when you get that first ding. If you’re looking for something standard and modern, a stock cabinet may suffice—especially if you’re changing the layout or starting from scratch. Quality is also a factor in your selection. Boxes, which are the bones of cabinets, are the components on which the hinges, doors (also called “fronts”) and countertops are installed. Think about all the closing, opening and knocking your cabinets will have to endure over the years. The materials and their subsequent durability are important. Plywood — made of sheets of solid wood — holds up the best over time. Stock cabinets are often made with particleboard or fiberboard, which are composites made of wood chips and resin that can be toxic — namely, the formaldehyde, considered a “probable human carcinogen” by the EPA may have short- and long-term adverse health effects. Particleboard and MDF doors will also buckle and bulge more quickly when they encounter water. Plywood simply handles moisture better, which is why it’s more expensive. Custom and semi-custom cabinets will give you greater options when it comes to other eco-friendly and non-toxic materials, too, including wood species, milling locations, paints and finishes. Many local suppliers use Pacific Northwest trees to mill their cabinets within the state of Washington. This means less of an environmental impact from CO2 emissions during travel, plus you’ll be supporting your local region. Now for the comparison you’ve been waiting for: cost. Stock cabinets cost much less than any custom or semi-custom order. Our rough estimates put the materials (not including labor) at half the cost. When custom cabinets for an average kitchen can cost $15,000 to $20,000, and up, the decision might simply come down to money. Even for a tiny kitchen remodel, stock could save you thousands. Though, the age-old adage “time is money” holds true for cabinets, too. Economies of scale make some stock cabinets significantly cheaper, but they may not come assembled. Cabinet orders that arrive in individual pieces will take more time to assemble, whether it’s yours or the time the contractor is billing you for. Alternately, custom cabinets arrive assembled. Finally, a custom-cabinet maker will have a designated sales representative available to help answer questions and troubleshoot if the need arises, but if you’re willing to do some legwork and trips to the store yourself, stock cabinets may work for you. 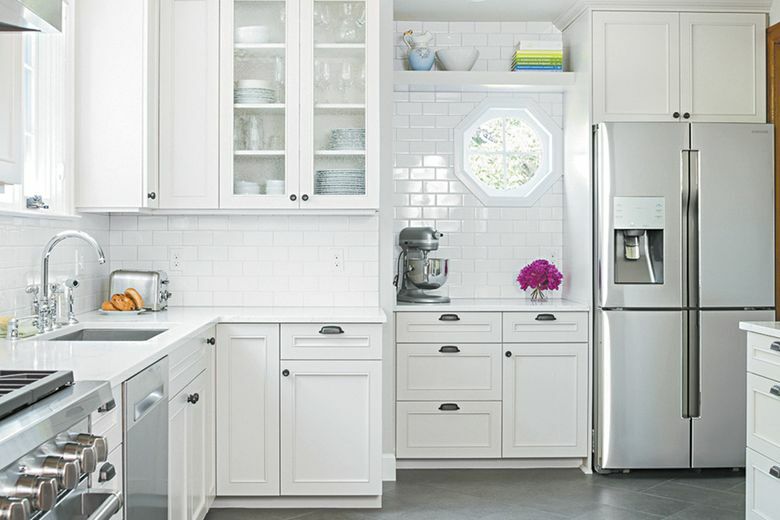 There are many factors to consider when choosing the right cabinets for your home, family and budget during a kitchen remodel, so be sure to think about your space and what’s most important to you. Emma Zimmerman is the marketing specialist at Model Remodel in Seattle and a member of the Master Builders Association (MBA) of King and Snohomish Counties, and HomeWork is the group’s weekly column. If you have a home improvement, remodeling or residential homebuilding question you’d like answered by one of the MBA’s more than 3,000 members, write to homework@mbaks.com.